As some of you may remember, this blog used to be called Movie Reviews for Greedy Capitalist Bastards, because I am one, and I have no truck with pretentious nonsense, vegetarians, and hippies. 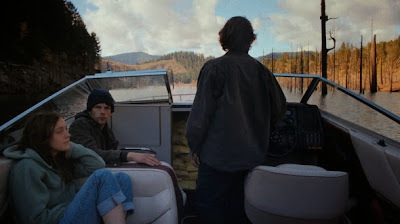 So Kelly Reichardt's new flick NIGHT MOVES, fell right into my lap! It shows you how do-gooding radical lefties can be as self-serving and arbitrarily violent as they would have usgreedy capitalists be. It's just that we own it! So, in this movie three radical tree huggers decide to blow up a damn because this is going to supposedly disrupt the water supply and teach us ipad users a lesson or two. The first hour of the flick basically plays as an anarchist revolutionary's handbook and I could definitely have done with a faster pace and more thrilling tense feel. It's always the way. Indie directors think they can do genre, but genre movies are hard, and shouldn't be condescend to. Making a taught thriller is not easy. Reichardt is on safer ground in the second half of the film where he can do his trademark interior exploration of psychology and mood. Once the deed is done we see problems open up. The preppie girl, Dena (Dakota Fanning) starts to feel guilty and blab. Peter Sardgaard's Harmon becomes all too predictably, the manipulative sinister voice on the end of a phone. That leaves us with the real emotional and psychological heart of the film: Jesse Eisenberg's Josh. His performance is so nuanced and moving in the final twenty minutes of the film that it elevates a rather second rate thriller into something altogether finer. NIGHT MOVES has a running time of 112 minutes. NIGHT MOVES played Venice Toronto and London 2013. It will be released in France on March 5th 2014. The cinema of Nagesh Kukunoor.